Lexi Shaw has been seeing Tyler Flynn since the beginning of the school year. Not the dating kind of seeing. He comes in the window and they never sleep. He is the only one who knows her secrets. The only one she trusts with her crush on the perfect Ben. Ben is her best friends brother. He seems so genuinely perfect. Lexi feels with her family, her past and her habits, she will never be good enough for him. Tyler makes her feel good about herself. He seems to be able to take or leave her. Lately he has hinted he wants to take more of her. What is a girl to do? She has made a reputation for being a good girl this year. She is trying to fit in with Ben and his friends. High School is unpredictable, and things can change in an instant. Tyler is the one who defends her even when she is not there. Ben has issues that may rival her mothers. Is this even a choice? Such an amazing story from start to finish! I was completely sucked in and could NOT put it down! I found the story compelling and the characters very complex. I was so anxious to see what would happen and was pleased to get to the finish. It was a great book, each and every page. ***This ARC was free from Netgalley.com and its publisher for review purposes only. Bad boy Tyler Flynn has been sneaking into Lexi's bedroom window for the last six months, but no one knows. Lexi actually likes the perfect Ben, so she hides her darker side behind the façade of being a good girl. She hangs around with the popular crowd, but her real best friend is her geeky neighbor Nolan - he's the only one she can really be herself with. She can't let her "friends" see the real her - the vulnerable girl abandoned by her father and with a self-involved mother who pays her no attention. Then, when Tyler starts acting weird, Lexi's absent father suddenly resurfaces, and Lexi receives unwanted advances from her mother's latest pervy boyfriend, Lexi knows she is in for one hell of a senior year. But, sometimes your true love can be right under your nose, and you just don't know it. Will Lexi get her much-needed happy ending? 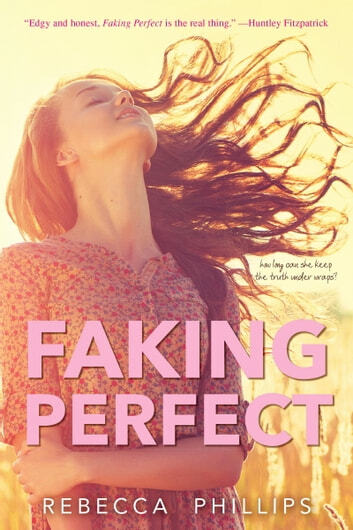 Faking Perfect is heartbreaking in its intensity and believability. Here is a girl who feels unloved and abandoned and looks for love in all the wrong places. She hides her secrets in her Corn Snakes book because she knows her mother will never go near it. This girl could be you, or your daughter, or your best friend. This girl is real. Being the mother of two teenage girls myself, this is scary stuff. Hopefully, books like this will prompt us to become more aware of what is going on in the lives of our loved ones. A perfect read for teenage girls and their families. I received this book in return for an honest review.